When George Harrison died here in Los Angeles, in the lush green hills a few miles distant, it rained. I wondered, after I heard the news of his departure, if he had been conscious enough to notice. I wondered if one of the reasons he had come to L.A. for his last hours was not merely to avert a post-mortem crush of mourning fans in New York, but to feel the warm sun one more time. It was sunny for most of the week or so that Harrison was here, when a few friends came to say goodbye, when drummer Jim Keltner described him as not looking like a person suffering from cancer---but smiling, with shining skin, "like a prince." As he faded, though, early on a Thursday afternoon, so did the L.A. light. The clouds gathered, the sky darkened, and it gently rained, as the man who once turned a few slight words about returning sunshine into a glorious anthem of hope, slipped away. The next day, the storm had passed. The sun returned, and the air around the world filled with memories of a gentle soul. "He had a magnanimous heart and always cared so much. He was a fearless and beautiful soul always conscious of God," said Ravi Shankar. "George was a true friend, intensely loyal, caring deeply for those he loved, and he inspired much love in return," said George Martin. "He was a giant, a great, great soul, with all of the humanity, all of the wit and humor, all the wisdom, the spirituality, the common sense of a man and compassion for people," said Bob Dylan. All the epitaphs and eulogies and tributes---that are yet appearing---have not only been effusive in their affection, but surprising in content. This was not merely an admired musician or celebrity. This was a deeply loved person of grace, courage, civility, kindness, earnestness, wit, integrity; a person who left all greatly affected. It's telling, and must be of some comfort to the family, that the accolades concerned Harrison's character as much as his musicianship. And as for the musicianship, hasn't it been gratifying to read all the paeans to his skill? 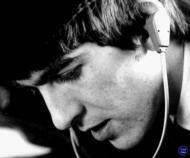 How his solos with The Beatles said just enough, how they were not flashy, but integral parts of the song personalities? How his inventive guitar comping and underpinnings formed such an essential sound---and spine---to Beatles music? How his dusky, portentous voice and harmony vocals were as invaluable to The Beatles as McCartney's bass, or Ringo's inimitable timekeeping? How his minor chord compositions injected greater depth, and even solemnity, into The Beatles' catalogue? How his songs---solo or with The Fabs---were variously wry, witty, tender, incisive, philosophical, gorgeous, and always sincere? How his slide guitar work was crystalline, distilled, eloquent, poignant? The praise has not been so much blind eulogizing; it was far too specific and thoughtful to have been so. There is almost the sense that friends and admirers held back their feelings, through the years, out of respect for Harrison's much-coveted privacy. Besides, the man famously shied away from compliments, and was dogged in playing down his musical worth, whether as a Beatle or solo artist. As he remarked in a 1987 interview I was fortunate to get when he was promoting Cloud Nine: "I'm not really a guitar player. I never felt like a proper one, you know," and of his Beatles solos: "I'd just play to the song. . .I got an idea of where to go, and I tended to blank out when I actually was doing the solo. . .I didn't really know what I'd done till afterward." Such modesty had early roots. From all the recent writing---notably Mikal Gilmore in Rolling Stone---one is almost tempted to place the beginning of the Beatles with the meeting of McCartney and Harrison. The pair palled around together for two years, singing and practicing guitar before McCartney joined the Quarrymen and persuaded John Lennon to let his friend join, too. Harrison, younger and slower to learn songwriting than Lennon and McCartney, had to accept his friend abandoning him as a primary musical partner, and content himself with the role of guitar specialist. Even in his solo years, Harrison often seemed happy to let others do his soloing---from Eric Clapton in Bangladesh to Robben Ford on the '74 tour. ("It's the overall thing I'm interested in,and somebody else can do it better than they can do it," he told me.) The spotlight-burn from Beatlemania didn't help matters, yet there was also the anti-egotism learned from Hinduism and LSD; Harrison just seemed destined for a life of modesty and magnaminity. 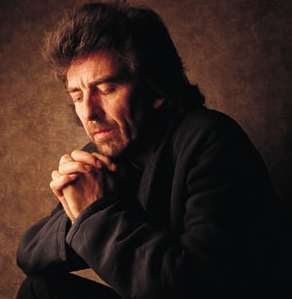 I burrowed into boxes recently, after my emotions settled a bit, and dug out my 1987 interview with George, along with another from 1979 from a press conference heralding the fine George Harrison album, as I sought to write something worthwhile about him. A number of quotes from '87 stood out, but none more than this one, spoken in request for a statement about John Lennon: "I think probably so much has been said about him already. But occasionally, you know, you miss him, because it would be fun to hang out with him," Harrison said, noticeably misty-eyed. "But at the same time, what I've got to believe in over the years is the spiritual thing, that death is only like changing your suit. So now you're in your physical body, and you're in your astral body. . .He was great, he was brilliant, and he was a great soul. Still is." These words are now equally applicable to. . .The Beatles' lead guitarist. I can remember him walking into the posh office at Warner Records/Dark Horse Records in Burbank, tanned and fit, with an open-collared Peter Max-ish shirt, black jacket with white flecks, and jeans. I also recall my state of mind. What, I wondered, does one ask of the fellow who wrote the epic philosophy to "Within You Without You" and "While My Guitar Gently Weeps?" I had attempted to address this problem by focusing on the mechanical job at hand, mentally repeating "just ask about the album," like the Hare Krishna mantra. I had even done something I rarely have in my career: I wrote my questions down. In the end, the thing that put me at ease was. . .Harrison. "It all sounds like it's the same guitarist," he said of most contemporary playing, "whether it's Whitesnake or Bon Jovi or whatever; they all play good, but it just sounds like it's the same fella." My favorite anecdote from the interview came in response to the question I'd most wanted to ask--- how did he come up with the exquisite, fluid, aching solo on "Something?" "Now, that is an example of that kind of thing where I find roughly where I can go," he said. "In those days, I don't know if that was an eight-track or whatever, but I remember specifically that it wasn't a clean empty track to put that solo on. Ringo was overdubbing something, and Paul was overdubbing something at the same time I was doing my solo. [As it turns out, on the final take, the orchestra was also playing live.] So in order for me to practice, I'd say, 'let's do it again, and again.' But they'd have to do their bits, too. Even in those days, there were times when we were also very cooperative, and we'd do that to help each other. And I think also I sort of smoked something, and I didn't really know what I was doing. I did that solo a number of times, and then we left and went on holiday, came back, put the tape back up, and I was very pleasantly surprised, because I did hit some right notes, and it did have a certain spontaneity to it." Translation: he worked really hard on it (it is built from the discarded vocal bridge that goes, in part, "I need that woman mine"), and wound up. . .inspired. "You know, there's something I've got," he said. "I don't quite know what it is---that came about, I'm sure, from the years I played the sitar. It gave me something that I know other people don't have." An articulation. . .a way of sustaining a line, bending a note. . .of writing sentences in his solos, not free-verse poetry. . .
"I need time," Harrison said simply. "I need to work out what I'm going to do, and then I have to work out how to play it." In other words, he composed. He didn't just improvise. Listen to the solos in "Fixing a Hole," his spotlight in "The End," "Learning How to Love You," "The Light That Has Lighted The World," Lennon's "Gimme some Truth," and you hear how he "worked out how to play" them in his head. They have structure, syntax, and development. Unlike the playing of many "greats," they are anything but pyrotechnic flourishes. These are thoughtful and original, deceptively simple sounding, invested with feeling. The conversational duet-solos in "Life Itself" and "Beautiful Girl"---where his solo guitars overlap and answer one another--- are impressively imaginative, virtuosic. Eric Clapton tells a little story about seeing Harrison smiling in the wings at a concert once, and realized that George could have played anything he or Hendrix did, if he'd wanted to. Harrison touched on this, in reference to the guitar heroes of the '80s: "There's a lot of players who are really good, but there's still not a lot of them who blow me away---and there's a lot of stuff that they do which I could do if I wanted to do that kind of thing." He didn't, and listeners are all the richer for it. A few weeks after Harrison joined the ethers, a friend put together a double CD of all of his Beatles songs, from "Cry For a Shadow" written with Lennon, forward. The legacy was impressive for many reasons, beginning with, in the early days, Harrison's underappreciated, rousing rock 'n' roll singing, and impeccable guitar. But it was the second CD, extending from "Only a Northern Song" through "I Me Mine" (including the acoustic "While My Guitar. . .", the demos for "All Things Must Pass," "Something, "Sour Milk Sea," and "Circles") that was absolutely eye-opening. This was the bandmember who consistently tried to make overt philosophical statements. Lennon and McCartney's statements or messages were spectacularly bound up in their art and musicality, less directly in the prose. Yet Harrison was deliberately, forthrightly trying to say something, and often something vast---whether "Try to realize it's all within yourself/ no one else can make you change" or "He who knows does not speak/ He who speaks does not know" or "I don't know how you were diverted/ you were perverted too" or "A cloudburst doesn't last all day. . ."
He courageously attempted to share his life's realizations, and succeeded bit by bit, album by album. When you hear all the "bits" together on one CD, it's powerful and jarring. The epic Beatles oeuvre would have benefitted from a few more Harrisongs and a few less "Maxwell's Silver Hammers." Still, George made up for the sporadic songwriting later, in his yet underrated solo years. As I wrote in Beatlefan # 132 (www.beatlefan.com) his work is my choice for best among the ex-Fabs for being the most substantial in melody, structure, and content. Thirty-Three and a Third, for instance, might yet be hailed as a minor masterpiece (especially if there are bonus tracks), as George played atypically numerous and lengthy solos (probably at the encouraging of producer Tom Scott.) All his albums, even the rather hasty "Extra Texture," and the post-scripty "Gone Troppo" contain some of the most affecting moments in his career. "You," "That's the Way it Goes," "Writing's on the Wall," "Life Itself," "Someplace Else," "When We Was Fab," "Be Here Now," "The Answer's At the End"---there are many similarly impressive grab-bag groupings of his songs. It's hard to find clinkers---and how many songwriters have ever sung a line as wonderful as "The speech of flowers excels the flowers of speech?" (from "The Answer's At The End.") The fact that Harrison sang openly of "God"---which was respected by fans, if not embraced---has acquired greater weight in recent years. The man's spiritual conviction now is known to have been abiding and devout, and the "God" songs duly inspire greater contemplation in listeners as the years gang up on mortality. A gold band in each pierced ear and a shirt covered with palm frond patterns (gardener theme), Harrison's opening words were to ask, in all sincerity, why people weren't enjoying the free scones on hand! Planting himself in a chair, he was promptly surrounded---and almost suffocated---by the always delicate press corps., patiently answering the usual array of dumb questions, self-deprecating, soft-spoken, even kindly. When a young woman reporter asked, wide-eyed and breathless, "George, what are you trying to teach us," he chuckled and muttered, "I guess I'm looking for somebody to teach me a few things." Oddly, no one followed up on the breathless reporter's question---except me, on the way out. I pushed through the mass of microphone-sprouting arms, sidled up beside him and said, "You said you're looking for someone to teach you a few things---like what?" Harrison's answer was droll, but had a ring of conviction that is heartbreaking in retrospect: "Like how to stop smoking." Looking back on my articles about the conference (in the Los Angeles Daily News, and Valley Magazine) it is obvious that the bulk of the questions---a year and a half before Dec. 8, 1980---centered on the prospect of "The Fabs" reuniting. Harrison acknowedged that "it was a privilege to have had that experience---to have been one of the Fab Four, because there were only four of us who had that whole experience." Still, the answer was no, "but if it did happen, there is no way we would do a mediocre record." His response to a query about incessant multi-million-dollar offers to regroup now seems ominously, gut-wrenchingly prophetic: "The Beatles can't save the world," he said. "I mean, we'll be lucky if we can save ourselves." It's downright amazing how much Harrison's comments that day foreshadowed remarks he made in The Beatles' Anthology in 1995. The Beatles, he said, were "four relatively sane people" who went around the world "while everyone else went crackers." "They were using us an excuse to go mad!" he declared, much as he would in Anthology. "I mean, it was 'Here come the Beatles! Crash! Let's smash up windows! Rip up limosines! Let's just have fun and go mad!'. . .Although everyone talks about The Beatles as being loved, we were loved for one minute, then they hated our guts. Then they loved us, then they hated us. That was probably one reason we all went into meditation. As the Maharishi Mahesh Yogi said, it's like being a little cork; like being a ship on the ocean at the mercy of whatever chopping or changing occurs---unless you're anchored to the bottom. That's what was happening to us. . .You just have to find some inner point to anchor yourself to." I recall the title, "The Inner Light" popping into my head during that last sentence. "I'm always entering new phases each day, as far as just trying to enjoy the moment more---just to experience the experience deeper. That's the main thing to remember, that we're all here now, and are we all happy? If we're not, we should try and be happier. The phase is to try and manifest love in your life. That's all I can try and do." Love Comes To Everyone. . .The Inner Light. . .All I've got to do is be happy. . .song titles and lyrics come to mind as I read this comment today, realizing how it evidenced the constancy of his themes and heartfelt commitment to them. Yet Harrison was hardly Martin Luther, as McCartney referred to him in jest in "Let 'Em In." The comic side of the man was, famously, as big as his spirituality. I had a slight brush with that side, which I am pleased to share here. I used to dine at a little sushi bar in Sherman Oaks, in the San Fernando Valley, where the people were friendly, the fish fresh, and the chefs committed the culinary sin of using brown rice. I also liked the place because they offered handout tracts advocating kindness and peace on earth. Lining the restaurant walls were twelve-inch by twelve-inch white squares of paper, signed by many of the more famous patrons---mostly actors and local politicians. You often find this sort of thing in sushi bars in L.A.---and perhaps, Japan---but these all centered around the restaurant's theme, "May Peace Prevail on Earth." You know, frilly actresses would write in frilly script, "Peace!" with little hearts and stars around it, then sign their frilly names, and so on. Well, one night, after a fair amount of sake, I stopped in my tracks and did a double-take outside the men's room, of all places, where Harrison's trademark signature graced one of the little squares. Above it, he had written: "Peace on Toast." And speaking of love and peace, there is one more anecdote I hope the reader will indulge here. In March or April of 2000, I went out to buy a new pair of shoes, one Wednesday, at the Santa Monica Place mall. It was around 1:30 in the afternoon, and almost empty, as I stepped on to an escalator behind two guys. I rode up one flight and turned for the next level, when one of them peripherally caught me eye. Black and white print shirt, jeans, salt-and-pepper hair, sunglasses---no big deal, but that profile. . .I looked more carefully. Then I heard an unmistakable voice speaking one word, "Okay." It was George. He looked good. Seeing as he'd been fighting cancer, and had nearly been stabbed to death by a contemptible madman just three months earlier, I was floored to see him out in public. No, floored isn't the word. I am an appreciator of The Beatles' music, and spirit, and of Harrison's---but I'm also a journalist, and a Beatlefan correspondent. The "scoop" value was momentous. I even had a proper excuse to say hello, seeing as I'd met and interviewed him twice. The cosmic cliché came to mind: was this meant to be? I wished more than I can say to introduce myself, tell him how great it was to see him well, and that I looked forward to new music. If I got a quote, well, swell. But as I watched Harrison scanning the mall, in search of what turned out to be an India imports store, I got to thinking that the last thing in the world this man wanted was to be bothered by a stranger. Especially considering the horrific intrusion he had just suffered. In that small moment, I had the privilege of giving him the one thing he most coveted in day-to-day life: a little privacy. 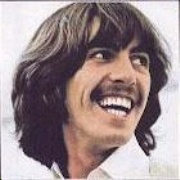 . .
Like Lennon, George Harrison never lived to be a grand old man of music. . .never got to be the wise old musical man of the mountain, making the occasional pilgrimage to loving audiences. And yet, in a way, he did, having retired from The Beatles at twenty-six, and then as a public figure, for the most part, after Lennon's passing. He was thereafter sought out by musicians to hear stories, share a pint or two, or if they were lucky, to have him guest on an album. There were dozens of such quietly realized appearances; George's slide guitar may be found on records from Duane Eddy to Carl Perkins to relative unknowns. He liked to play. As I was writing this, I received an e-mail from a reader that says, in part: "It was good to know he was out there." That cuts to the heart of the matter. You didn't see George perform often, except in the occasional music video or tribute to Perkins or Dylan, or The Beatles' Anthology. You didn't hear from him often, his last album of new songs coming in 1987, but you always knew he was. . .out there. And it was good to know. Good to know that you shared living space with a person of such grace and artistry, especially considering the daily onslaught of savagery and hatred emanating from mass media. Knowing that people like Harrison, and the other Beatles, and figures from Jane Goodall to Muhammad Ali are "out there" is such a comfort. Even if they are doing nothing more than, as Harrison did in his final years, living quietly with family, gardening. 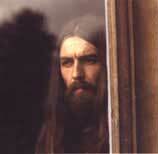 . .
George once remarked of Lennon's death that it still felt like his old mate was around. As if he had just gone off to New York, and had never come back. In that sense, maybe one can think of Harrison as still being "around." He wasn't a personal friend to most of us; he was a presence. Now the physical person has gone away, as Lennon did from him, but so much evidence of the presence remains. In song, film, interview, memory, and conversation. 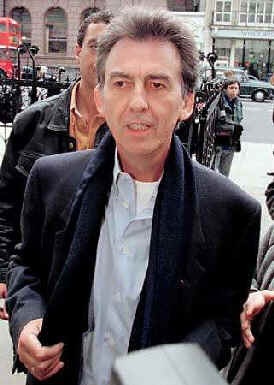 So, in a way, George Harrison is still "out there." He has just changed suits, as he would say. I like to think that the new one shines brightly. Every morning at dawn.